If the webpage didn’t say www.usmarshals.gov in the address bar, it’d look like a poorly disguised scam. The page, which looks like it came out of the 1990s (no SSL either for a government website?) is offering 50,000 bitcoins for sale, an amount worth $11.8 million at current market prices. This sealed bid auction is for 50,000 bitcoins separated into two series: Series A (10 blocks of 2,000 bitcoins), and Series B (10 blocks of 3,000 bitcoins). You will not have the opportunity to view other bids. You will not have the opportunity to change your bid once submitted. Bidding ends at Noon on March 2nd and in order to bid you have to wire the U.S. Marshals at least $100,000 upfront just to be considered a legitimate bidder. The old fashion system instructs bidders to email them their driver’s license, completed bidder form, and receipt that says they wired them a hundred grand. There’s a special email address to do this and they should hear back from someone if they get approved. I bet you never thought you’d seen an email address like this, USMSBitcoins@usdoj.gov. Can I form a syndicate of buyers? The person or entity that registers to bid on this auction must satisfy all registration requirements, including certifying that the bidder is not acting in concert with the defendant or defendant entity. This certification extends and applies to all members of a syndicate. The primary bidder should perform whatever due diligence the bidder feels is necessary in order to comfortably make that certification. And if you don’t win, the Marshals will just ACH your deposit back, but not until after they’ve probably put you on some kind of watch list. Nothing says suspicious person like randomly wiring 100k+ to the U.S. 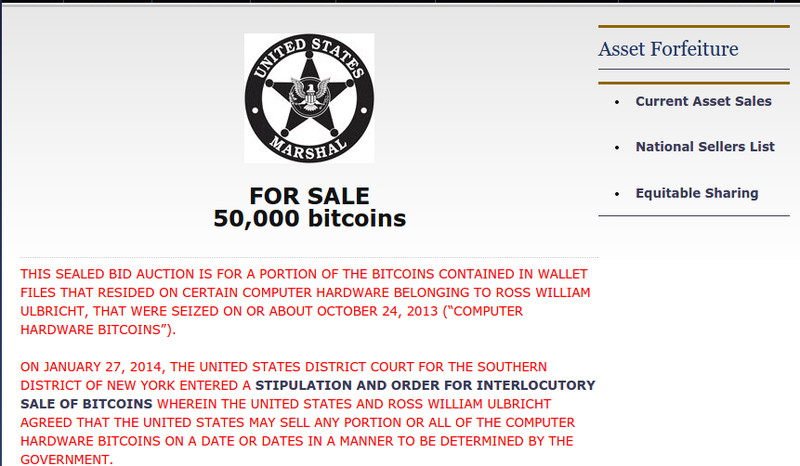 Marshals just so you can be considered a bitcoin bidder. Expect them to be curious about who you are. Hopefully their technology is more advanced than the way their website looks though.